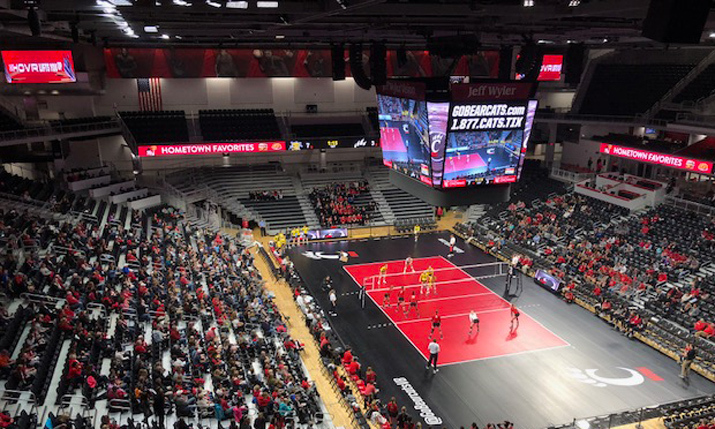 The University of Cincinnati’s Fifth Third Arena, home to the Bearcats’ basketball and volleyball teams, went through a massive overhaul in March 2017 with extensive changes to seating, amenities, and overall look. The biggest change was installation of Daktronics videoboards, including a centerhung system that reaches from one three-point line to the other. So that construction could proceed without distractions, the men’s basketball team played the 2017-18 campaign at BB&T Arena on the campus of Northern Kentucky University. The women’s basketball and volleyball teams played at nearby St. Ursula Academy. When all three teams returned home, they were greeted by an $87 million renovation. As with the $86 million undertaking at Nippert Stadium in 2012-14, the university received monetary funding from outside donors to enhance the 15-year-old videoboard in Fifth Third. 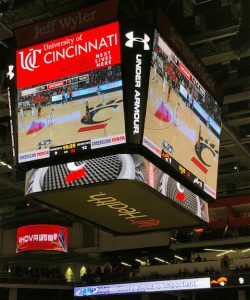 The new centerhung videoboard at Fifth Third Arena comprises nine separate elements, 3.9 million LEDs, and close to 2,000 sq. ft. of display area. Part of a wide array of advances, 36 new video displays were placed throughout the arena. The rectangular centerhung is cut into nine separate elements: two facing the sidelines (16 x 27 ft.), two facing the ends of the arena (16 x 16 ft.), four curves between the main slabs (16 x 6 ft.), and a ring beneath (3 ft. high x 86 ft. in circumference). On the court, ribbon boards outline the seating area and two mounted stanchion displays along the sides of the baskets. Four 9.5- x 28-ft. ring LED boards in each corner supply additional stats. With more than 7 million LEDs and 5,700 sq. ft. of coverage, the centerhung alone accounts for 3.9 million LEDs and close to 2,000 sq. ft. The arena’s interior architecture emphasizes constant viewability of the LED behemoth: fans can view the scoreboard throughout the venue, with the help of two 360-degree concourses. To ensure resolution quality and size for each display, video settings needed to be adjusted to fit the space’s specific requirements. For example, the centerhung has different dimensions for each panel. In addition, the production team needed to rethink filming strategy and execution prior to game time. Productions in Fifth Third Arena rely heavily on the full-scale control room at Nipper Stadium next door. In a fibered network and a shared infrastructure in terms of equipment, the neighboring venues work hand-in-hand. The arena’s interior architecture enables the centerhung videoboard and other displays to be seen throughout the space. Since joining UC in August 2014, Coffey has seen the university’s program mature and improve. To top off the alterations that will wow fans in the stands, Fifth Third Arena houses a fully furnished classroom for teaching the next wave of broadcast professionals. 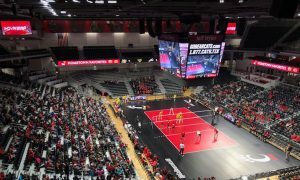 Recently, the women’s volleyball team watched their draw in the national tournament with the NCAA Selection Show shown on the videoboard. Also, the live production shown on the videoboard has been integrated into the team website’s live-stream workflow.